5,500 bee hotels were distributed at Södra's local annual meetings in March. The aim of the hotels is to increase the number of solitary bees and promote natural diversity. 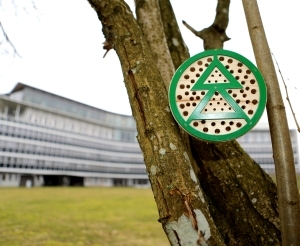 March 22, 2019 - To promote natural diversity, Södra is placing 5,500 bee hotels in its members' forests and gardens. The hotels are designed to accommodate solitary bees and the guests will hopefully move in this spring. 5,500 bee hotels were distributed at Södra's local annual meetings in March. The aim of the hotels is to increase the number of solitary bees and promote natural diversity, which will improve pollination and lead to higher yields of fruit and berries. Södra is Sweden's largest forest-owner association, with 52,000 forest owners as its members. Södra is also an international forest industry Group, with operations based on processing its members' forest products, such as softwood and hardwood pulp, and wood products. To learn more, please visit: www.sodra.com.